Let’s learn how to play a fun folk song with this Go Tell Aunt Rhody ukulele tutorial, complete with chords, lyrics, strumming pattern and melody tab. 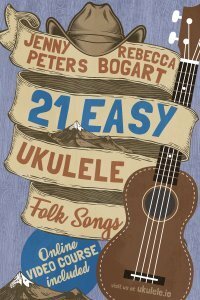 You can also find complete music sheet for Go Tell Aunt Rhody from our new book 21 Easy Ukulele Folk Songs. 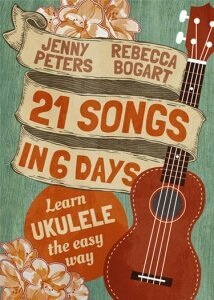 Get your copy here and learn to play carefully selected folk songs on ukulele. 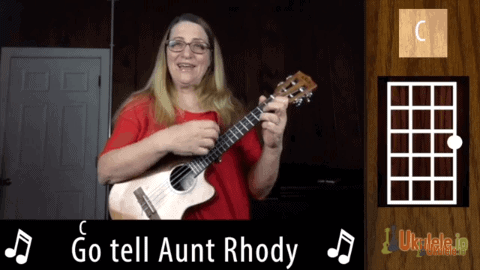 Indeed, this Go Tell Aunt Rhody ukulele tutorial is easy with just three chords. And it’s even more fun because Jenny plays the song in two keys – C and F. In the key of C, you’ll need these ukulele chords: C, F and G7. While in the key of F, you’ll need F, Bb and C7. The strumming pattern is also an easy D-DU-D-DU replication (D-down, U-up). Finally, melody tab devotees won’t be disappointed because Jenny also does solo ukulele. If you want lyrics and chords sheet for the song, contact us and we’ll email it to you. Also, subscribe here and receive weekly newsletters about our featured song and other ukulele lessons. Most importantly, you also get sheet music for the week’s ukulele tutorial. To learn more about how to play Go Tell Aunt Rhody on ukulele, join us on Facebook. Jenny will conduct a Facebook live session for this song later in the week. If you miss the live lesson, worry not because you can view the recording on the videos section of our Facebook page. Although Go Tell Aunt Rhody is a traditional folk song which has been around for centuries, the younger generation are quite familiar with it. Michael A. Levine, an American composer, created a sinister version of Go Tell Aunt Rhody as a theme song for a popular video game called Resident Evil 7: BioHazard. According to Levine, the video game developer company Capcom liked the idea of turning a familiar song from its known jolly version to something scary. But Capcom was interested in using a traditional song popular in many countries. Historians traced the melody of Go Tell Aunt Rhody to a tune composed by philosopher Jean Jacques Rousseau for a French opera in the mid-18th century. However, many believed that the melody may have earlier renditions where Rousseau referenced his tune. Subsequently, the tune traveled to England and other parts of Europe and eventually to the US and Japan.